History and identification is provided below the scans. Thanks as always to our 'friend in the hobby' for piecing everything together with his research. 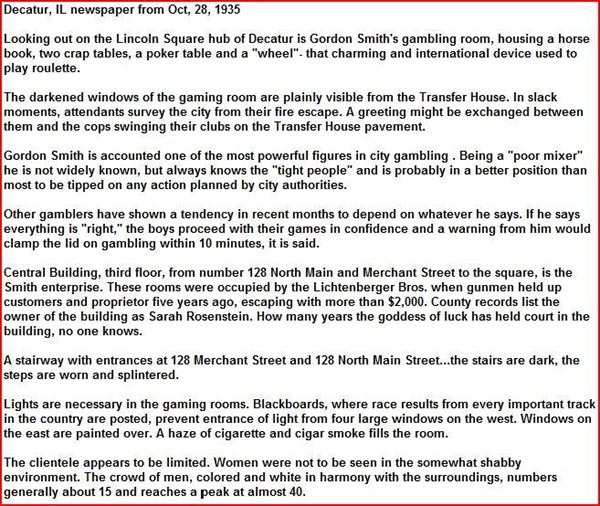 Seems that the area of Decatur (in particular) and Clinton, IL had plenty of gambling going on in the early 1930's including a cluster of operations around Merchant Street/Main Street in Decatur. Smith ran his main operation at the Federal Bakery, 124-1/2 Merchant Street, Decatur, and the top row of 4 chips in the scan were all used there. The GES chips were shipped to Smith, the OCC and TW to his accomplices Oscar Chapman & Thomas W Stockton. Ive shown the GES chips although I dont have any for sale. Diagonally across the quadrant, "Eph" Gammon operated at the Coney Island Restaurant, 107-1/2 Main St. 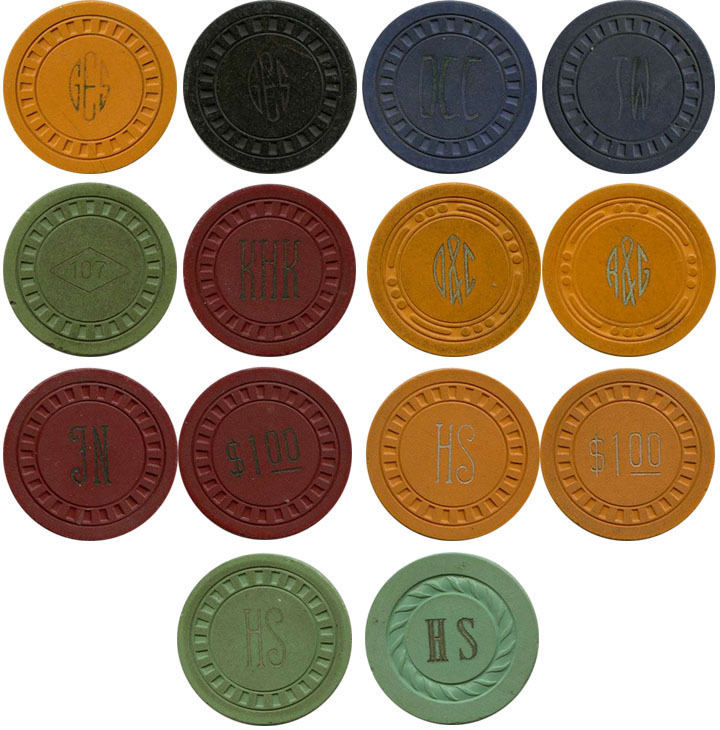 He used the 107 in diamond chips and the KHK shipped c/o Raymond Robert Hudgens to the same address. 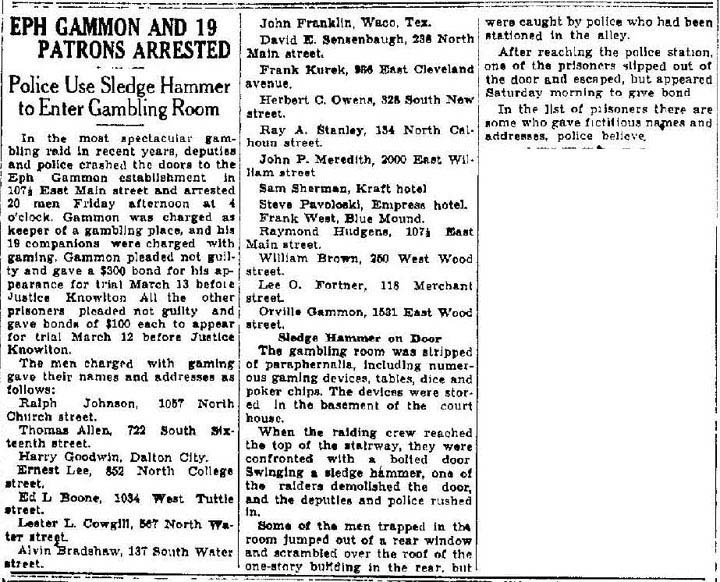 After Gammon's place at 107-1/2 East Main was raided, he moved his operation outside the city limits to Lake Decatur for a while. 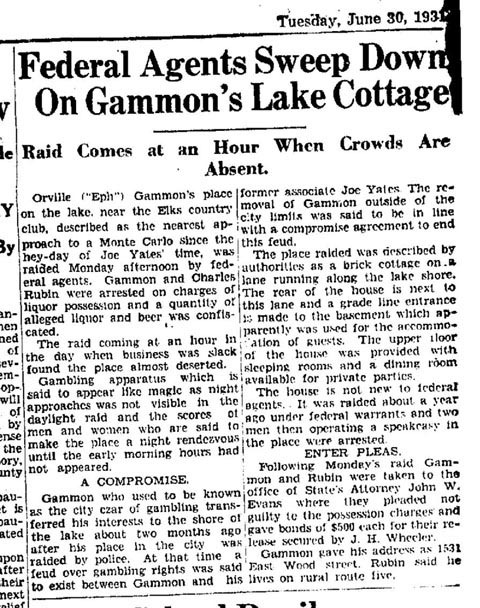 Gaming took place at "Gammon's Lake Cottage", which seems more like a mansion given its description in a subsequent arrest report - in particular "described as the nearest approach to a Monte Carlo since the heyday of Joe Yates' time". He ran this operation with Charles Rubin. The tri-ball mold O&C/R&G being Orville & Charles/Rubin & Gammon. At the same time, David Howard Server (HS) was busy operating at the Clinton Billiards Hall (also apparently a whorehouse), Macon St, Clinton, IL. The 3 HS mold chips were used there, along with the FN hub mold, shipped to George W. Newberry (whose nickname may have been 'Frosty') at the same place. 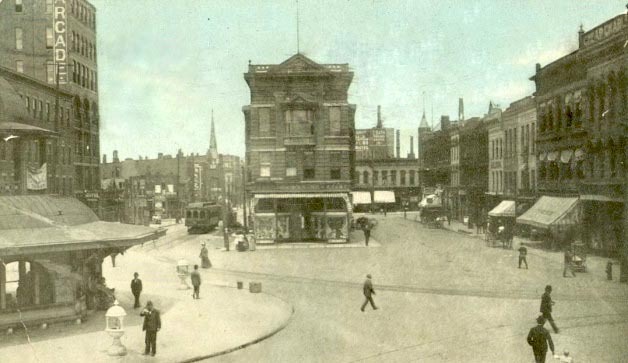 Below is a street view of Decatur from 1910 which shows Merchant St. on the right, North Main on the left and the Central Building in the middle. Below that, a few of the arrest/raid reports.